Mobile devices and the new generation of tablets have replaced the mouse with the finger. A left swipe of a finger turns the page. Legacy users with laptops and PC's still depend on mice and touch pads to navigate through the web. To help millions of users transition from pointers to touch interfaces, we have implemented the ability to swipe left and right, using a pointer, to turn pages. 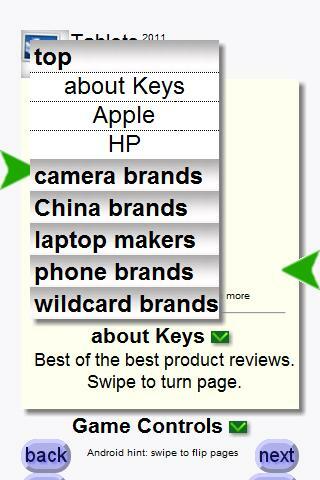 Click and hold down on the active area of a Keys-by-TEARN app. Swipe the mouse about an inch to the right or left. Of course, this is really one continuous flow - and not 3 distinct steps. Tap and app below to try the new feature on your PC. We've added video content to every term of every app. Select the Watch button to select videos. Keys is a new publishing platform that reveals the depth and breadth of the global web - and enables information discovery, entertainment, and true learning. The web has become millions of daily voices - updated via websites, blogs, and social networks. Search allows missle-like access to the most common content; but the breadth and depth of the global web has still been poorly served. Great content and voices are frequently buried among the billions of pages that is the global web. The Keys platform has compiled over 600 subjects into apps - where the breadth and depth of each subject is made easily accessible to users. Our combined apps cover a vocabulary of over 30,000 terms - when the average adult learns some 20,000 over a lifetime. Each app explores the breadth of a subject and digs to the depth of the web. Activities aid the memorization of terms - that leads to true learning - versus the brief browsing that is easily forgotten. Over one million apps have been downloaded. Thank you. As many mobile networks have upgraded to 3G and 4G performance, we have extended Keys beyond photo collections to video streams. Our search reveals all publicly available videos. Of course, most of the videos are hosted by Youtube courtesy of Google. The net effect is that video doubles the content available for every subject and every term. From recipe choices, to biology lessons, to word definitions, to travel destinations, to sports trivia - you have more content available with a tap. Tap the Watch button to access the video collection. Select a video by tapping one image. Flick the page or use the flow selector to select new terms and more video choices. 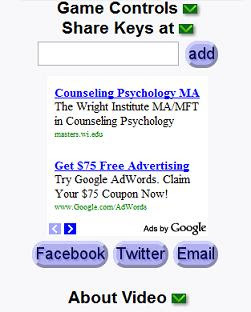 Has Keys become the multimedia portal for learning by subject? Please share the battle song - every download saves a shrub, a can of oil, possibly a dolphin, and one mind. PS: Total downloads have passed 1,100,000. Thank you. The problem has been discussed in a prior article. The challenge is to present the best image to mobile users despite slow networks and devices. Facebook is a closed network for photo sharing. Google and Flickr maintain smaller snippets of photos on their servers, thus accelerating delivery of images to their users. The Keys platform is an open social network that retrieves the best, most relevant, original images from servers located throughout the world. Unfortunately, with slow servers and slow mobile networks - this has been a very hard problem to solve. This becomes an aggravated challenge when we present images from remote countries of the world. Fetching one image in ten seconds from a old server in Mongolia is one example of the problem. Avoiding deleted photos at Photobucket is another. Long time users may have noticed that our SmartLoad technology shows better and better images without loss of performance. We have continued our efforts to build better filters, caching, and optimization - so that the images seem to improve as you watch the show. The first time you see an image, you may be looking at the smaller snippet from Google. In the background, we're still loading the original, hi-res image -- so that your second look of the image shows the original image -- despite slow servers and networks. Tap on any image to visit the original source. Happy Holidays! Subscribe to this blog, below. Bringing high-resolution images over slow performing networks to mobile users has been an agonizing challenge. We finally have the right balance. Our apps pulls relevant images from millions of servers located throughout the world. Slow servers, slow wireless networks, and slow devices make this an interesting challenge. Too many of the web servers are under-powered - unable to respond quickly to our requests. Many are located on slow hosting sites. 3G as a transport can be highly constricting. Slow devices are unable to display our animation in a timely fashion. Thus, we've been forced to rely on low-resolution images stored on Google and Microsoft's fast server networks. Our engineers have managed to create a balance between high resolution images and performance. If the high-resolution image is stored on an adequate server and network, then we show the best image. If the image cannot be retrieved in a timely fashion, then we show Google or Microsoft's shrunken version of the image. As more wireless networks evolve to 4G performance, our results will improve automatically. Hope you enjoy the improvements. Select one of the apps below and try the new slide shows. When using the flow selectors, touch the arrow and slide to save the 1/10th second delay to recognize a tap. Try slide on iPhone and Android devices.